Realtime Gaming launched a new slot game today. Grande Vegas Casino is not only one of the first online casinos to offer the hilarious new Lucha Libre slot, they've also got one of the best casino bonuses offers for it! They'll give you a 125% bonus up to $125 to check it out. Lucha Libre is a hilarious wrestling-themed game with grouped wilds and a fun bonus feature that’s triggered by three or more Scatters. When a wild Wrestler symbol appears they either double your prize or jump onto at least one more reel. The Mask symbol triggersrr the Mask of Doom feature where reels with Scatters can be held. Lucha Libre is a new wrestling-themed online slot game from Realtime Gaming. 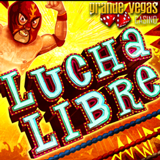 Grande Vegas has been adding mobile versions of many of its most popular online casino games, Lucha Libre is the first one to be launched at the same time on both the desktop/laptop platform and the mobile platform for smartphones and tablets. Grande Vegas Casino is popular around the world and offers hundreds of games from Realtime Gaming. Lucha Libre is the 27th game in its mobile casino. Grande Vegas will give you 25% Cashback on your last deposit if your account gets too low.